This is a riveting, insightful and inspiring story of the journey of business tycoon Narendra Raval, endearingly known as ‘Guru’, from a little village Mathak in Gujarat, India to East Africa where he helms his industrial conglomerate of steel, cement, infrastructure and aviation. This critically acclaimed and engrossing autobiography written in collaboration with his close friend Kailash Mota, narrates four decades in his illustrious life as industrial entrepreneur and philanthropist, who with his devotion, dedication, humility, business acumen, vision, foresight, hard work, and tenacity, successfully built a US $650 million business empire, with more than 4,500 employees across East Africa. But it has not all been a smooth climb to the top. His eventful life has had ups and downs but call it fate or destiny, various unexpected turns have gradually propelled him to success and fame. Raval was born in August 1961 in a Gujarati-Brahmin family. He was a naughty and mischievous child who liked to play pranks on his family members, friends, teachers, neighbors etc. He was never keen on his studies. Instead he liked helping his grandfather and later his father in running their shops and farms. Mathak had a small school with classes up to Grade five only, so at the age of ten, he was sent to his maternal uncle in Jodiya for further studies. His innate business skills were honed in Jodiya and Balamba. He tried different innovative and imaginative ways of making money to help his family. After two years, he went to a boarding school in Surendranagar.Life was regimented and tough at the school but he learnt Sanskrit which later helped him become a temple priest. From Surendranagar, he was admitted into Shree Swaminarayan School and Shree Swaminarayan Gurukul in Bhuj. He earned a small salary as Gruhpati and also dakshina from devotees for performing their traditional rites and rituals. Whatever little he earned, he sent it his father. He completed his final year High School in Alfred High School. A stroke of luck began a new chapter in his life. He was offered a priest’s position at East Africa Satsang Temple in Nairobi. Raval immediately accepted the offer and after family’s consent took his first air- flight to Nairobi, Kenya. The daily routine for 18-year-old Raval was strenuous and demanding but he rose to the challenge and with God’s blessings learnt to perform all the priestly duties. In his spare time, he learnt the local lingua , Swahili, and often communicates with the indigenous citizens in the local language which at once puts them at ease. He also performed marriage, housewarmings and office opening ceremonies at devotee’s homes and workplaces to supplement his income and to socialize with the community. His knowledge of astrology, palmistry and horoscopes helped him build up useful contacts.With the help of loans from devotees he was able to help his brother’s college education and sister’s wedding expenses. After three years he left the Temple and headed to Kisumu and then to Nakuru. Because of his knowledge of Hindu scriptures,rites and rituals, palmistry, and horoscopes,devotees started calling him “ Guru”. Another turning point in his life came when Dayabhai Patel and his sons in Nairobi, who owned the biggest and most successful steel rolling mill in Kenya and a trading arm, Steel Wares, invited Gurubhai to stay with the family in their home. In his spare time, Raval went to their office and the factory and learnt the ropes of conducting business and manufacturing steel products. After the business closed down, another friend Ashok Patel, a partner in Delta Hardware in Nakuru permitted Raval to open a branch in Nairobi. Delta Hardware became the biggest wholesale supplier in Kenya but owing to family reasons, shut down. Guru and Neeta, a qualified chemist in Thika met and got married in December, 1985. Guru proudly believes that their union brought luck in his life and owes his success to his beloved wife Neeta. Guru decided to start his own business. He set up Steel Centre Ltd.in a rented warehouse in Gikomba, a rough locality of Nairobi. Both husband and wife fearlessly worked hard and for long hours in a very daunting environment and after five years became Kenya’s largest hardware suppliers. Guru became Kenya citizen and decided to go into manufacturing. Devki Steel Mills was set up in Athi River and began production in November 1995.Melting furnaces were added, and galvanized roofing sheets were also manufactured. Alu Zinc line was one more successful step in further growth of the business. Devki Group’s third major diversification and initiative was the National Cement Co.Ltd.to manufacture Portland cement, at Lukenya on Nairobi-Mombasa Highway. The grinding mill was installed in 2011 to begin production of cement under the brand name ‘Simba Cement’. The Clinker plant at Emali on the Nairobi-Mombasa Highway, commenced commercial production in June 2017. In May 2018, operations commenced at the National Cement Co.Uganda Ltd.in Tororo, Uganda. For packaging, Maisha Packaging Co’s plant for polypropylene (PP) bags was set up within National Cement’s premises at Lukenya. The memoir recounts Guru’s dream of riding a helicopter. When he was twelve years old, the then Prime Minister of India, Smt. Indira Gandhi visited Surendranagar, in a helicopter, on one of her election campaigns. This was when Guru’s dream to not only fly in one but to have his own aircraft was born. In 2014, after getting a Private pilot’s license, Guru acquired his first commercial helicopter. On his maiden helicopter ride, seventy children from the orphanage in Athi River, Kenya, took turns to fly with him. Guru’s pride and joy on this occasion was unlimited. Now Devki Group owns an aviation company, Northwood Agencies Ltd. And has three helicopters. This achievement shows Guru’s passion for learning new things and his eyes light up when he sits in the pilot’s seat. 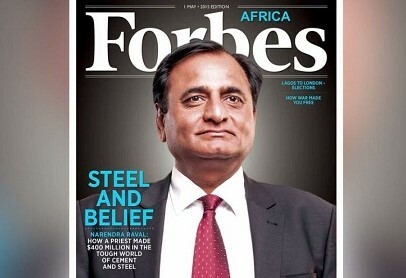 He has been featured among the top 50 richest men in the Forbes Africa 2015 List. He has won a number of accolades including Presidents Award of Kenya in 2007. In 2012, the British Government honored him with an award for promoting the welfare of widows in Kenya. Lions Club of Nakuru, bestowed the Melvin Jones Fellowship Award in Aug.2012. Guru utilizes 50% of his earnings on charity. Devki Group assists people in building their homes, provides food, nutrition, medical support, clothing, water, electricity, education, books, employment, etc. It has set up an orphanage in Athi River, and Devki Primary Sch.at Ruiru.It has also adopted the Devki Emukutan School at Emali. The students get one free meal per day. The students are sponsored for University education ,and provided gainful employment later. Lord Raj Loomba in London, a Founder/Chairman of The Loomba Foundation, is helping widows and their children. After meeting him in London, Guru became a Trustee of the Foundation for Africa, and now helps widows become self-reliant and independent. He is on Board of Trustees for the International Society for Krishna Consciousness (ISKCON) in Kenya. Through its ‘Food for Life program’ it serves hot meals every afternoon to 3,000 children. He often participates in serving meals to the children personally. Guru commends his wife Neeta for being a pillar of strength in his life, for being a supportive friend, a loving partner and a caring parent. They have three children, Devang, Tulsi, Devrath, a daughter-in-law Prakurti and two grandchildren Aaryan and Ananya. The mesmerizing memoir, a glowing testament to Guru’s family’s entrepreneurial spirit, loyalty and love for Africa, tenacity, trust and philanthropy is bound to resonate with the Indian diaspora. 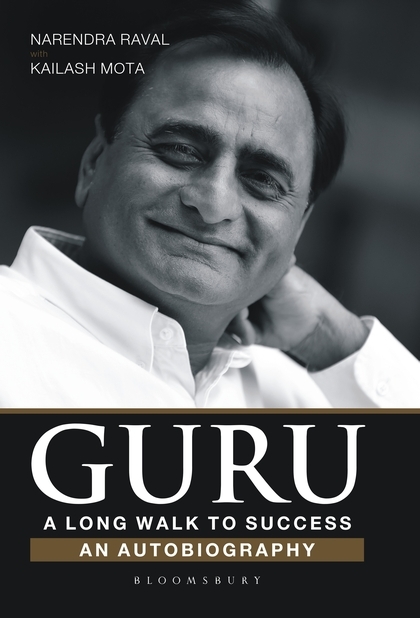 It is a fast read with anecdotes, inspirational quotes, Guru’s life lessons and practical guidelines for succeeding as an entrepreneur. The biography conveys a very strong message to the young Kenyan generation that with hard work and perseverance many things are possible .He wants to show young aspiring people that there is another way – you can push the boundaries and do something meaningful through ambition and endeavor. It is a moving tale of a self- made man who rose from a poor child whose family could not afford to buy him a decent pair of shoes and often had to go to sleep without a meal as they could not afford food, to a giant in the steel and cement industry and most of all in spite of all the success and wealth has not lost his humility and generosity with an abundance of kindness. A pleasure to read and a MUST READ!